Up until last Wednesday, my hands had not touched an Archie comic since I was a teenager. My favorite characters were Betty and Jughead, and I couldn’t stand that snot nosed, boyfriend-stealing Veronica. But now the zombie apocalypse has called upon me to return to the Archie universe. Not to fight zombies, but to follow the catastrophic happenings in Riverdale. In the first issue, Jughead took the body of his deceased dog, Hot Dog, to Sabrina the witch for help. When Sabrina’s aunts told Jughead that Hot Dog couldn’t be saved, Sabrina hinted at necromancy, the dangerous act of raising the dead. If you know Sabrina, then you know that she went against the witch laws, and raised Hot Dog from his grave. Hot Dog returned as a zombie, and has spread the virus on to Jughead. In Afterlife with Archie #2, Jughead appeared at the school’s masquerade party looking zombified. It didn’t take long for anyone to notice that Jughead was not acting right. When it became obvious what was going on, Archie led the survivors away from the school to safety. For now. This new chiller grabbed my attention in its’ debut issue. For some unknown reason, I didn’t know about the series until last Wednesday. I found a copy of the first issue at the comic shop, but they were sold out of the second issue. I drove across town to another shop, and they were out. I could have gone digital but I prefer printed material. Both shops had more books ordered, but I was having a hard time keeping my instant addiction to this book under control. Two days later I drove an hour to a comic shop and bought the second issue. What makes Afterlife with Archie so captivating is the dark and twisted take on a well-loved comic. We are seeing the characters as we’ve never seen them before. Dark, cold, gruesome, fighting for their lives and the lives of others. This new thriller is sure to reel in past readers, just as quickly as I was hooked. Archie has been around for a very long time, so this title is going to grab the attention of readers of all ages. Roberto Aguirre-Sacasa is the writer of this outstanding series. Dialogue and pacing at its’ best. The artwork by Francesco Francavilla is awesome. The cover alone is enough to tell you what you’re in for. Because of the violence and mature content, this title is rated teen+. Please exercise caution when reading this book around young children. After I read the first issue, I immediately emailed the comic shop and asked to have the book added to my pulls. 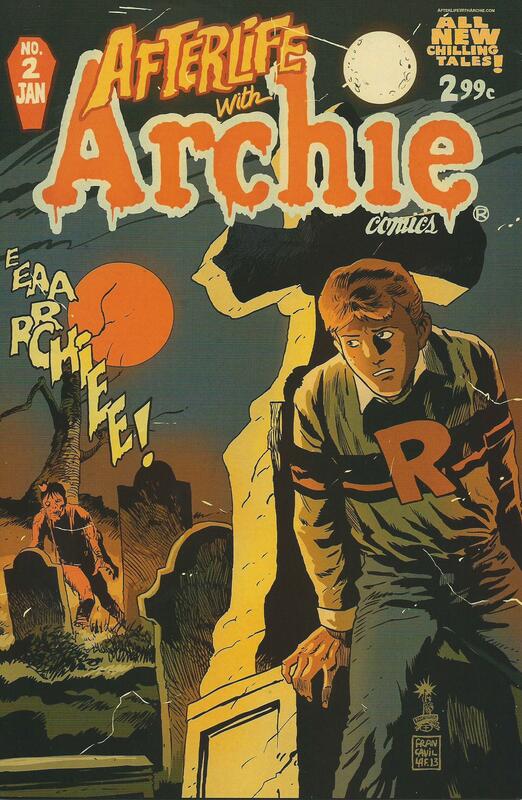 As a lifelong horror and Archie fan, there is no doubt that I will continue to read this horrific series. I recommend this title to horror and Archie fans. I also recommend this series for new and returning comic readers that are looking for something fresh and new. Archie Comics isn’t new, but the dark and chilling twist is definitely a first.